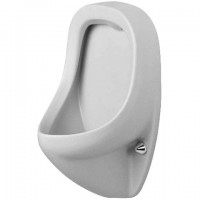 Duravit Ben urinal is a classic urinal, which is available with or without fly. The fly serves as a target the man and thus ensures more cleanliness. In addition, the Duravit WonderGliss coating guarantees long-lasting cleanliness and good look of the Duravit Ben urinal. When installing your Duravit Ben urinal you have the choice between an inlet from above and an inlet from rear. No matter what inlet you choose, your Duravit Ben urinal is always equipped with the practical Duravit extraction technology.